The Hawkes Bay and surrounds. We ship country wide. Roofi­ng sheets and structural aluminium for DIY and installers­. Reply to emails and phone messages promptly. Free quotes can arrange site visits 6 days a week. Long standing and reputable business installing unique covers and canopies. References available. We can attach our covers to existing timber structures or build new aluminium freestanding structure or attach our structures onto existing buildings. Planned and built to fit in with the house design so the structures do not look like an 'add on'. High quality, low maintenance materials used. All screws,rivets etc are stainless steel. We have our own range of structural aluminium extrusions, gutters, beams, etc. All structures built with structural grade NZ extruded aluminium. Structures powder coated to colour of customer's choice. Able to install flat curved or pitched roofs. There are a number of coverings available including flat sheet plexiglass (30 year warranty) polycarbonate flat sheets, corrugated polycarbonate, multiwall, easyroll sheeting or PVC. Structures will not rust, can withstand severe weather and are completely waterproof. Plexiglass, polycarbonate and multiwall sheets are installed with rubber compression seals so they do not leak and are not noisy in the wind or when they expand or contract. 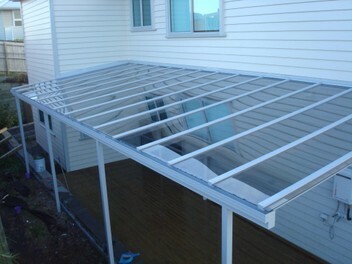 All flashings are custom folded aluminium . All final cuts are done on site to ensure absolute precision and high quality finish. We also supply drop down curtains, horizontal blinds to fit under covers and canopies to give extra shade in summer. Fixed clear or mesh screens available. For large projects we a have a specialist engineer who oversees the project. Pride in completing work to a high standard.